Nothing says luxury yachting vacation like a new Fountaine Pajot Saba 50. Sea Dragon is the perfect blend of style, class, comfort, and adventure. 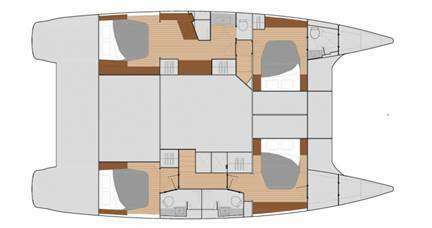 Featuring a flybridge with ample space to lounge and sunbathe as well as two cushioned seating areas on the foredeck, guests will never be more relaxed. The catamaran’s expansive cockpit includes sun shades and extra seating in addition to the dining table. The yacht’s interior opens into a bright salon and indoor dining area and large galley. Sea Dragon offers sleeping for up to 6 guest in 3 Queen cabins. Each cabin is en-suite with separate stall showers. The Master Cabin is extremely spacious! 1.French omelets filled with Boursin cheese alongside heirloom tomatoes on fresh sourdough toast, served with crispy bacon. 2.Lemon ricotta pancakes topped with powdered sugar and lemon zest, alongside gouda scrambled eggs and pork sausages. 3.Fresh sourdough toast topped with zesty avocado mash garnished with radish and red pepper flakes, served with chili oil fried eggs and crispy bacon. 4.Fresh baked Guava cheese braided bread alongside eggs any style and chicken sausages. 5.Juevos Rancheros featuring fresh made corn tortillas, sunny side up eggs, fresh made Mexican beans, local chorizo, and fresh pico de gallo. 6.Scrambled Eggs Florentine served with fresh baked thick cut grilled crusty bread and fennel spiced chicken sausages. 7.Scandanavian plate featuring salmon two ways, smoked and lox, grilled whole wheat seed bread, hard boiled eggs, pickled onions, labne, cucumber slices and local heirloom tomatoes, seasoned with my own everything mix and smoked flake salt. 8.Eggs benedict on fresh baked English muffins, topped with ham, poached eggs, and hollandaise then served alongside crispy bacon and spicy potato breakfast hash. 1.Spiced lamb meatballs served on freshly made, grilled flatbreads and topped with red cabbage slaw, herbed yogurt, lemon wedges, harissa, and mixed herbs; served alongside Mediterranean quinoa salad. 2.Mediterranean plate featuring sliced paprika fennel rubbed chicken, jammy roasted lemon wedges, tzatziki, Greek olives, hummus, sliced cucumbers and seasoned orzo; served with family style pita and labne, grilled halloumi drizzled with local honey, and dolmades. 4.Pulled pork sandwiches on Hawaiian rolls served with Alix’s German-ish potato salad, cornbread muffins, and grilled watermelon salad. 6.Seared sesame crusted ahi with ginger lemon cream sauce, soy scallion drizzle, avocado rosette, pickled ginger and a side of mango salsa served over rice. 7.Herby Thai shrimp salad dressed in a ginger, lime, peanut dressing and topped with fried ginger, shallots and garlic. 8.Miso glazed salmon with warm soba noodles and stir fried vegetables served with shallots and spiced soy drizzle. 1.Grilled flank steak with charred scallion relish served over brown rice and accompanied by a tangy snap pea and radish salad. 2.Honey garlic crispy chicken served with creamy polenta and a side of lotus root and Asian pear salad. 3.Crispy skin salmon served with green romesco sauce, roasted purple potatoes, and a side of blistered green beans with lemony tahini labne all topped with a salsa of radishes, shallots and lemon. 5.Whole harissa roasted snapper served with blistered cherry tomatoes and a grilled orange on a bed of cous cous served with a mint and grapefruit side salad. 6.Seared scallops served with lemon white wine sauce, warm Brussel sprout and pancetta salad, and creamy parsnip puree. 7.Roasted whole chicken served with Persian Tadik saffron rice, roasted vegetable salad, and a light pan sauce. Contact us for rates and current availability or to book a charter aboard Sea Dragon! Grand Marnier French Toast: Thick slices of home-style bread or Brioche dipped in a blend of Grand Marnier, orange juice, cinnamon ,and nutmeg - cooked crisp and golden served with orange slices and bacon or smoky links. Eggs Benedict: Lightly toasted English muffins topped with Canadian bacon, a perfectly poached egg topped with fresh Hollandaise Sauce- served with breakfast potatoes and Mimosas or Bloody Mary's. Huevos Rancheros: Refried pinto beans layered on top of a warm corn tortilla topped with eggs, sunny-side up and fresh tomato salsa, sprinkled with queso fresco and cilantro - accompanied by local avocado slices. Sweet or Savory Crepes: Sweet - crepes with sugar & lemon or served with cream and fresh Fruit. Savory - crepes stuffed with scrambled eggs, mushrooms and bacon. Turkey Panini: Boar's Head Smoked Turkey sliced thin, swiss cheese, red onion and slices of avocado on a baguette press-melted Panini style, served with bacon ranch pasta salad. Green Bean Crisps: Fresh Green Beans smothered in parmesan cheese and oven-baked served with a Sriracha dipping sauce. Everything was AWESOME! LOVED Matt & Kendra and the boat/trip couldn’t have been better. Matt & Kendra welcomed us like old friends from the minute we stepped on board - they were fabulous! We were eager to get away from the harbor and they understood completely. Within minutes of stepping on board, we were off. Since we didn’t arrive until 4pm we didn’t go very far but Matt had a perfect spot picked out with fabulous snorkeling and a private cove for the evening. Not only were they accommodating to our every need and request, but they came up with fabulous ideas that made every day an adventure. We enjoyed spectacular cocktails every evening on the upper deck in the beautiful setting of the BVIs. Every day Matt seemed to bring out a new “toy” that not only the “kids” (ages 19-21) were eager to engage in but the adults tried a few as well. As our kids wrote in the Zephyr book when we left ”it’s not always about where you go, but who you go with - Matt & Kendra became family”. The Zephyr was spectacular. Every inch of the boat was constructed so efficiently and seemed far more spacious than its 50 feet. The beds were extremely comfortable and Kendra spoiled us all by cleaning our rooms every day and even changing sheets and towels midway through. There is always a little noise from the generator but that didn’t seem to bother anyone. It’s hard to pick a favorite aspect of the boat but I think we all spent the most amount of time on the upper deck which was wonderful to be on anytime of the day. We all enjoy our coffee in the morning and the boat had some of the best coffee I’ve ever had. Sipping that on the upper deck in the quiet of the morning was priceless! I’m not sure Kendra ever slept, she was always busy preparing the next meal or making the kitchen spotless - she worked so hard! She spoiled us all with her cooking. We talked extensively with Matt about the itinerary and I would not have changed anything. He understood what we wanted and what we had seen in the past and made fabulous suggestions on where to go next - So happy we made it to Anegada, especially because we got to spend the day together with Matt & Kendra! John Lane at Sailing Directions seemed to be waiting on the other end every time I sent an email - the service was top notch!